Tata Motors’ dealers are offering personalization options for their latest vehicle – the Harrier SUV. While we have already seen Tata dealers offering roof wraps for the Harrier, some dealers are now going the extra mile to offer both a dual tone paint scheme and graphics. 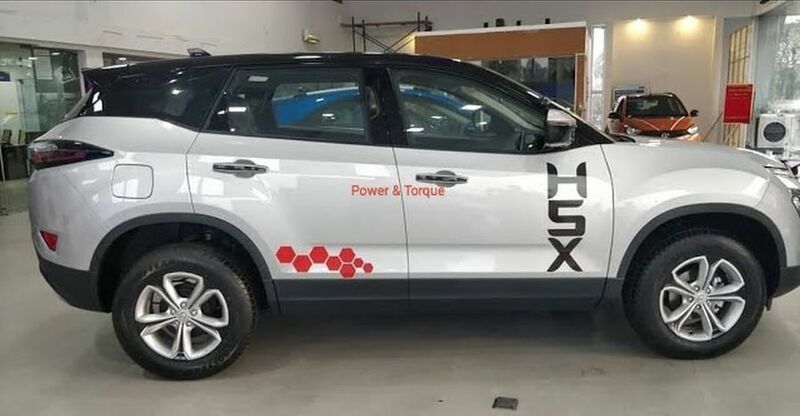 Here is a video from Power&Torque that shows one such customized Tata Harrier, which gets a dual tone paint scheme and decals that help it stand out from the rest of the Harriers on the road. The Harrier has been a big success for Tata Motors. In March 2018, the SUV overtook both the Mahindra XUV500 and Jeep Compass in terms of sales, clocking well over 2,000 units. In the coming months, similar numbers or even higher numbers are likely as the Harrier continues to command long waiting times. In case of the base, XE trim, waiting periods for the Tata Harrier stretch up to 4 months. SUV. The LS550 platform has been suitably modified for the Indian market, and is now called OMEGA. Currently, Tata Motors sells the Harrier with a single engine-gearbox combination. The engine is a 2 liter, turbocharged Fiat Multijet unit with 140 Bhp of peak power on tap, and 250 Nm of peak torque. The gearbox is a 6 speed manual. Front wheel drive is standard, and Tata Motors offers multiple driving modes that includes the ‘rough road’ mode. There are no plans for an all wheel drive variant. What Tata will soon offer though is a 6 speed automatic gearbox on the Harrier. This torque converter automatic gearbox will be sourced from Hyundai, and is meant to make the Harrier an attractive buy for those seeking the sheer convenience that an automatic gearbox offers. The Tata Harrier Automatic is expected to be launched by the end of this year. Tata Motors is also working on a turbocharged petrol engine for the Harrier. The 1.6 liter turbocharged petrol engine is expected to make its debut on the Harrier sometime next year, close to the Bharat Stage 6 emission norms. There’s also talk of a petrol-hybrid option for the Harrier in future. An exact timeline for launch of the petrol hybrid variant is unavailable for now.